Felix River Kwai - Kanchanaburi is picturesquely set in exquisite natural gardens, on the banks of the Kwai Yai River. The Hotel's low rise buildings are in perfect harmony with the surroundings. The famous bridge and numerous attractions are nearby. 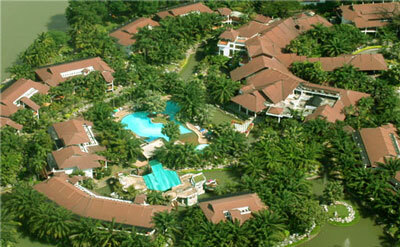 The resort has an invitingly relaxed feeling and is located a mere 2 hours from Bangkok. A complement of 255 beautifully appointed rooms, include one and two bedroom suites. All rooms are fully air-conditioned and feature colour TV, IDD Telephone, Safe Deposit Box, Refrigerator with mini-bar, Radio, Bathtub and shower. Room Service is available 24 hours. The Lobby features Foreign Exchange facilities, Tour desk, with sports and gift shops just around the corner. Car rental, Laundry & Valet services and a daily shuttle service from Bangkok are also available. Sai Yok Pool - A luxuriously large free style pool suitable for all guests to relax and enjoy the lush garden surrounding. Tarn Lod Swimming Pool - A half Olympic pool located next to the River Kwai. Sauna - Closely located next to the Sai Yok pool bar. Fitness Center - Located next to the Main Building, a ideal workout place. Health Center - Located next to the main building offering aromatic, traditional massage and foot reflexology. Jogging Track - A 2 kilometer scenic track along the river and front of the resort. Tennis Courts - Two newly done up outdoor tennis cours with the backdrop of the Bridge. Bicycles - For rent, please contact our front desk counter. River Raft for leisure or with lunch or dinner cruise - Offer daily cruise with a minimum requirement of 30 guests or guest will be informed accordingly of the cancellation by our staffs. Felix Station 9 (obstacles course) - Fun for family having small private activities trying out the course or company’s teambuilding. The Palm Garden Brasseries - "An All Day Dining Restaurant with A Breath Taking Garden View fill with Exotic Palms and Plants. The Brasserie Showcase A Mix of both Local Thai and International Cuisine"
The Good Earth - "Serves The Best Authenic Cantonese Cuisine In Town And Good Selection of Tim Sum Dishes"
The Rantee Louge - "Entertainment Outlet Located on The Lower Lobby Floor, Providing Daily (except Sunday) Relaxing Music by Live Entertainers from The Philippines"
The Green Wave Karaoke & Fun Pub - "A Place To Unwind & Relax In The Evening"
The TerraceCafe - Served a variety of delicious pastry for our very own baker. Sai Yok Pool Bar - "An Oasis For True Relaxation"
Sanooker Lounge - "(New) Two Snooker Tables Located on The Upper Lobby and Drinks Can Be Ordered from The Cafe' Terrance at Tthe Main Lobby.